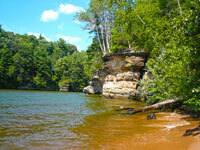 The Sandy Beach Resort in Wisconsin Dells offers a cozy, secluded getaway right on gorgeous Lake Delton. Minutes away from the excitement of all of the famous attractions of Wisconsin Dells, Sandy Beach Resort has lovely north woods-style cottages where you and your family can enjoy a wide variety of activities including boating, fishing, swimming and lounging on Lake Delton’s idyllic beaches. Sandy Beach Resort also has plenty of outdoor fun with paddleboats, canoes, shuffleboard, ping pong and children’s play area—all you could want in a home-style, vacation destination. Great place to stay room are super clean and friendly staff. Great place. I had lots of fun. It’s close to all the fun Wisconsin Dells attractions, like: The Ducks.